He Wants to Find his Bicycle! Ten minutes later, after a quick local phone call, wily old Police Constable Johnny Plebworth returned with tea, biscuits and sympathy. They were still there, half an hour later, when the phone rang. Johnny shuffled into the back and answered it. He stifled a smile before he returned to update his Lordship. This story is inspired by the photo supplied by Al Forbes of Sunday Photo Fiction, October 24th 2015. For more details click the logo. Thanks for the positive comment, Helen. Next week’s story will depend on the prompt! Hehe That’s what he gets for making the villagers hate him so much. Love it. Thanks. They’re a rebellious bunch! Thanks. The arrogant Lord may want to think about his behaviour in future! Thanks. That’s a great description! A very good use of satire to sum up a situation. He definitely needs to rethink the way that he is treating his people! Thanks! He could end up with more than he bargained for! I liked the setting. Nice story. Thanks Graham. I think it’s a setting I could return to in the future. Thanks, Helen. It’s definitely a warning for him! I saw him as an experienced Local ‘Bobby’ who knew everyone inside out. He’d make a fun character in a longer story. Ha ha, serves him right! If you want to make the rules someone will break it! Good that all his furniture is out on the lawn. Very good story! Thanks. I think that was just the beginning! Mmmm yes just the ears of the hippo as they say it in South Africa! Thanks. I wonder if he will figure this out! A wonderful tale of village life! 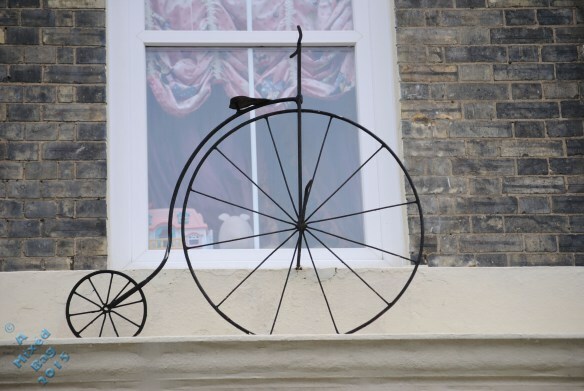 My friend owned a pub in Sussex with three penny farthings hanging from the bar ceiling. But he actually owns them. We called it the Threepence Three Farthings! Thanks for the comment. I think there is room to expand these characters. I can vividly picture the entire village and its characters! Wonderfully written! Thanks. I’d like to take these characters further with another story. Power corrupts absolutely. I’d say Lord B is getting what he deserves for not having a heart for the people lower on the social scale. Thanks. Let’s hope he learns from it.